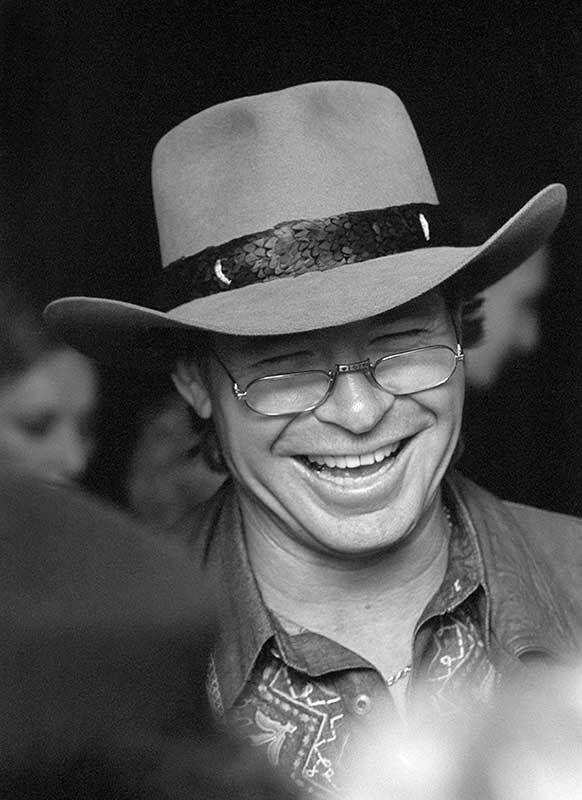 John Denver (31 December 1943 - 12 October 1997) rose to musical stardom in the late sixties, with his fresh style of country music which celebrated his love of the great outdoors, and of the Rocky Mountains of Colorado. A devoted humanitarian and environmentalist, John wrote many songs which had a message of hope for a better world. He won many awards for his music, and produced thirty albums. He also loved flying, which would eventually claim his life as he was at the controls of a newly-acquired experimental aircraft, which went into a steep dive over Monterey Bay, California, while he was apparently grappling with a badly-designed fuel lever. He performed in Melbourne, Australia during 1991, and I was invited to photograph him at a meet-and-greet function at the Hilton Hotel which had been organised by the GENI Foundation. I had set up studio flash equipment at one side of the reception room, and asked John if he would mind stepping over there whenever he was ready. “Sure thing!”, he cheerfully said, but I was swiftly confronted by some young guy who seemed outraged that I had dared to speak directly to John. “You do not tell Mr. Denver what to do, you speak to me first!”. I explained what I was hoping to do, only to be told that there would not be time for him to stand where I had set up; even though I wanted him to continue chatting to people as I shot pictures in my nicely lit area. “No, you’ll just have to make do”, he said. I really wanted to say to him "Relax, buddy, we're in Australia now". I had never encountered such officiousness, and, through gritted teeth, shot in less than ideal conditions. This picture was the best of the few that I managed to get.